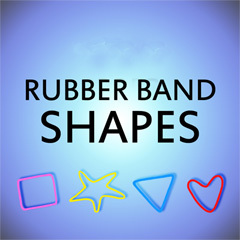 These great little rubber bands are pre-formed into four different shapes; hearts, triangles, squares, and stars. These fun props are perfect for kids magic, rubber band magic, or any close-up magic that needs a peculiar twist. Each pack contains approximately 24 rubber bands of your desired shape. Colors vary and may include blue, pink, red, and yellow.